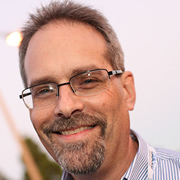 I was saddened to read that technology journalist Marc Orchant passed away this afternoon, having been unconscious for several days following a major heart attack. I only met Marc once in person, but he struck me as vibrant, fit, and extremely likable. He is survived by his wife and two children. If you feel moved to help support them through what must be an incredibly challenging holiday time, details on making a donation are available here. Marc’s was a lightning-quick creative intelligence and, coupled with his love of technology, made for stimulating conversation and insightful reading on ZDNet and, later, blognation. The blogosphere is abuzz with tributes to his memory. For my part, I would like to extend my heartfelt condolences to his family, and hope that they are buoyed up by the support of friends and family during this time.